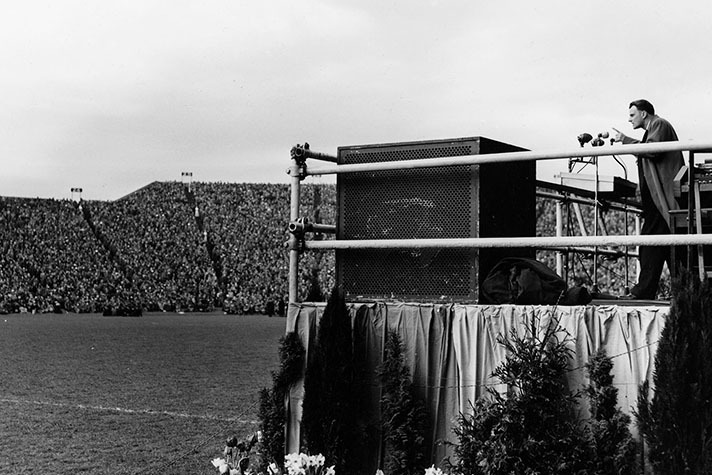 Billy Graham preaches inside a packed Hampden Stadium in Glasgow, Scotland, in 1955. More than 60 years ago, Billy Graham spent six unforgettable weeks in Scotland, sharing the Gospel from metropolitan Glasgow to coastal Aberdeen. The message reached more than two-and-a-half million people, resulting in at least 50,000 recorded decisions for Christ. One of those decisions came from a 19-year-old man named James Smith. As a result, God rewrote his family’s story in a way that has rippled across generations. On April 24, 1955, James “Jim” Smith stepped off a bus in his hometown of Fraserburgh, Scotland, planning to catch a movie. 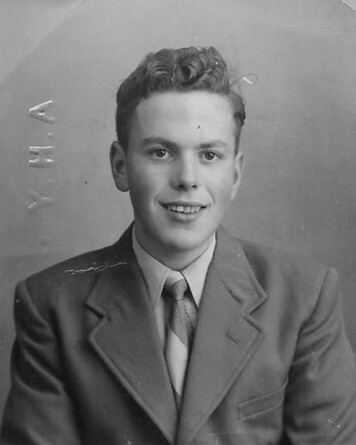 Jim Smith in 1954, the year before he gave his life to Christ at the All Scotland Crusade, changing the course of his family’s history. Instead, he found himself drawn to the church at the center of town, where a crowd was gathering to listen to Billy Graham’s message—broadcast from Glasgow, some 200 miles southwest of seaside Fraserburgh. Not from a Christian home, Jim had poked his head into the church the previous week out of sheer curiosity. He still remembers what it was like inside the church during the final week of the March 21-April 30 All Scotland Crusade. Jim gave his life to Christ that night, at age 19. “My mother got saved the very next night,” Jim said. This 2-minute video from news archive producer British Pathé takes you inside the 1955 All Scotland Crusade at Kelvin Hall, Glasgow. Jim is now 79 years old and still walking with God. After he met his wife, Margaret, he found out she had been involved in the 1955 All Scotland Crusade as part of the prayer team. In fact, there’s a good chance she was praying for lost souls at the very moment her future husband was discovering Jesus. 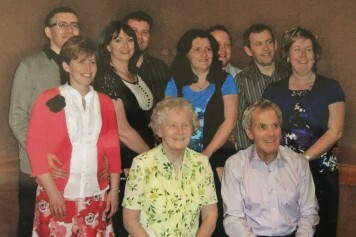 Margaret and Jim Smith (seated), surrounded by their four children and their spouses. Today they have four children, 10 grandchildren and one great-grandchild. God’s perfect sequence of events is not lost on Margaret and Jim’s son, Andrew Smith, the longtime pastor of Whitburn Assembly of God, and area leader of Scotland for Assemblies of God Great Britain. Thanks to his father’s decision—and likely his mother’s prayers—60 years ago, Andrew is part of a family of believers carrying a legacy of faith to new generations. As part of the leadership team for Billy Graham’s Mission Scotland ’91, Andrew had the chance to meet Mr. Graham and experience part of what his father did so many years ago. 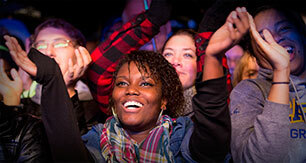 In 1991 in Glasgow, Edinburgh and Aberdeen, a quarter-of-a-million people heard the Gospel over the course of two weeks. Andrew watched it all from the stage. Two decades later, Mr. Graham is no longer preaching to packed stadiums, but his message is still reaching the world. Through efforts like Internet Evangelism and My Hope, the Billy Graham Evangelistic Association is continuing to take the Gospel to the United Kingdom. This Easter and beyond, thousands of churches are participating in My Hope with Billy Graham UK by showing the 30-minute video The Cross. It features a clear Gospel message from Mr. Graham, coupled with true stories of life transformation from rapper Lecrae and singer Lacey. As a pastor and a dad, Andrew is carrying the torch of faith sparked by his father’s decision 60 years ago. Now he prays the light will continue to burn across Scotland, starting with his own children and extending to generations to come. “That’s my biggest dream,” he said. In the UK? Watch and share The Cross this Easter or anytime. In the US? Watch and share the latest My Hope video, Heaven. 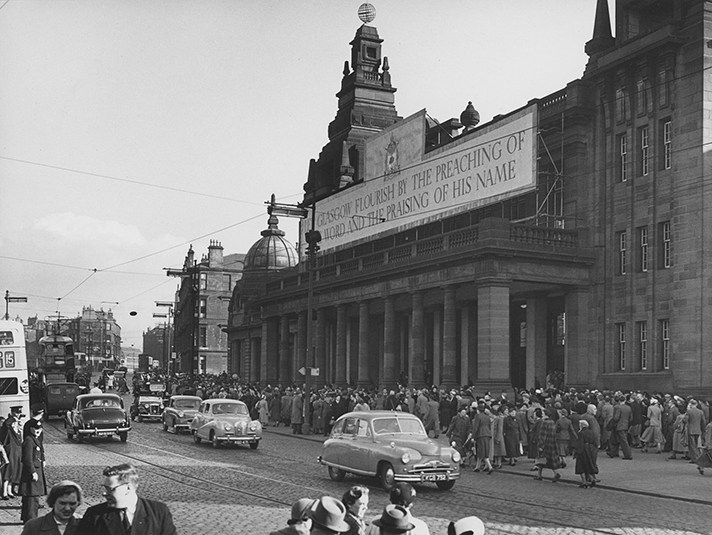 The outside of Kelvin Hall in Glasgow, ground zero for the 1955 All Scotland Crusade.